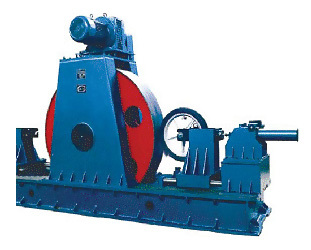 It adopts floor welding structure design, horizontal load frame loading, big drum adopts international standard design, diameter 1707mm, imitate vividly road condition, excitation speed-adjusting motor drive drum to realize stepless adjusting speed, and test under different driving speed. Loading bracket uses lower damp linear component driving. Panasonic servo motor drive closed loop control. Load is measured by load cell. To realize closed loop control to fatigue test and emergency stop function when wheel was destroyed by fatigue. Configured with industry control computer, A/D convert integrated card board inside computer completes signal amplifying and signal module converting. Computer software is supported by WINDOWS, with the function of dynamic display, saving, output test report, etc. Strong electricity controller completes to drum driving motor and control emergency stop. It is mainly used to complete torsion fatigue test and inspection to light alloy wheel of Motorcycle or Light Motorcycle. It adopts lectric measure, stepless adjusting test frequency, digital display test parameters. It is provided with output to omputer to realize extended function.